Girls monogrammed dark chocolate brown and hot pink quilted duffle bag for after school activities, overnight trips, club events and sports. Child or pre-teen size. Charming durable quilted construction with reinforced bottom. Includes name or monogram. 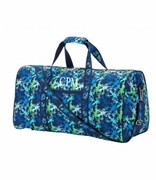 Monogrammed girls sport bag measures 14"W x 8"H, 8" across bottom. Lined with interior zip and exterior zipper pocket. Removable snap bows. Over the shoulder carry and zip closure. Supported bottom with metal feet. 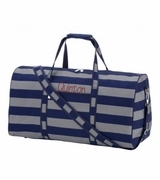 At Last � Monogrammed Duffle Bags For Girls!